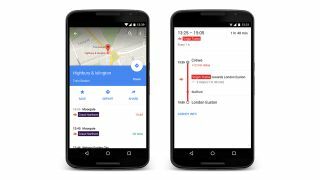 Good news for anyone travelling home for Christmas - Google has just told us that it's launched real time National Rail data in its Maps app. This means that you'll now be notified of any train delays when searching for public transport directions. And should your train be cancelled, Google Maps will try to re-route you as best as it can. Finally, the update also lets you tap on a National Rail station on the map to see a list of departing trains in real time, so you'll hopefully enjoy a stress-free journey this festive season while Chris Rea is stuck top to toe in tailbacks.